An experienced fighter, Fortunato’s skills have faded with age. 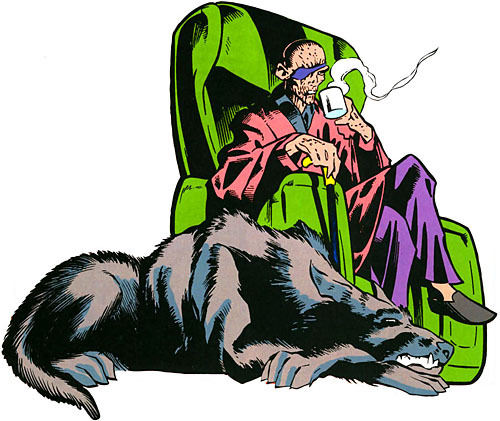 He relies primarily on underlings, or his pet wolf, Angel, trained for lethal attacks on command. Fortunato is highly skilled in organised crime. As a young boy, Fortunato dreamed of leaving his life as a poor shepherd in Malta and becoming more powerful and important. He realised those dreams in New York City, where he rose through the ranks of organised crime, becoming the right hand man to top boss Don Rigoletto. A young Wilson Fisk killed Rigoletto, despite Fortunato’s warnings to the Don. While meeting with the crime reporter Jacob Conover Fortunato was ambushed by Fisk’s men. Conover created a distraction, enabling Fortunato to slay his attackers. Indebted to Conover, Fortunato went into hiding while Fisk became the Kingpin of crime. Cruel “One Eye” Fortunato, with his pet wolf Angel, became the stuff of urban legends. After building a power base in Rome, he returned to New York in the guise of a grocer, running his organisation from the shadows.